The Toscana Folding Teak Table is a superb choice for those who like their luxury wherever they go! A beautifully constructed piece; the Toscana Folding Teak Table with its timeless tabletop and modern folding design, this table stores easily and adjusts to 28″ or 29″ dining height. This excellent table pairs with a variety of chairs including teak folding as well as wicker, stainless or mesh! With tightly placed slats on the table top, a wide frame and slender yet robust legs, the Toscana Folding Teak Table is contained elegance and the perfect piece for your garden, home or office. The Toscana Folding Teak Table is made out of A-Grade Teak; a material we are proud to carry for its beauty, durability and is ideal for outdoors! The A-Grade is given when the wood has been cut after 40 years of growth, ensuring that it has naturally generated its own supply of oil and rubber, which means the wood is durable whether it is treated or not and is more repellent to termites and other wood bugs. We sell the vast majority of our teak as raw, meaning we leave it untreated with sealants or oils because we believe it is beautiful as is! If you wish to retain the honey color, it is a simple case of using an appropriate oil or seal which you can obtain from a good marine store. Or alternatively look up a teak specialist in your area who can stain, seal and care for your teak. The maintenance is extremely low on these products, making them even more desirable! Simply wash with a cloth/brush following the grain of the wood a few times a year, and your furniture will look incredible, taking on a lovely sheen and brilliant finish. Purchase a Toscana Folding Teak Table with a couple of substantial folding teak side chairs, to create a classic set that you can easily store away for those trips to the beach or when you need to open out your patio. Imagine this darling table gracing your sun room with a couple of our loungey dining chairs in a patterned, slimmer wicker with a soft, pastel Sunbrella® pad for comfort and to add a pinch of glamor to the setting. You will be enjoying a glass of wine as the sun sets on your glorious home in no time! 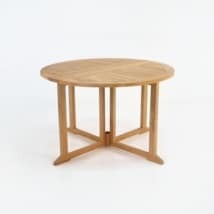 As well as the gorgeous Toscana Folding Teak Table, we also have other square, round and rectangular tables available in similar and diverse sizes, to suit various spaces and requirements. The Toscana range also boasts benches, bar units, bar and counter chairs so you can tie the look together and kit your home out in a beautiful, stately collection! Teak Warehouse also offers many different products and materials that complement each other in different ways! For instance, if you are craving a collision of modern, minimalist and tasteful within a small dining set; try this Toscana Folding Teak Table with a couple of our Reclaimed Teak Stools and a concrete and glass hurricane lamp. Our range of materials include all weather wicker, stainless steel, Sunbrella® fabrics, Reclaimed Teak, Raw Concrete and, of course, A-Grade Teak. Our customers love to pick and choose from these materials, whether they are buying a lounger, deep seating, a dining set or a bench; Teak Warehouse is able to cater to your needs. Call us today to see what other collaborations we can piece together to suit your space. Our sales assistants are on the floor 7 days a week, ready to work with you to make the best of your outdoor area. We are highly knowledgeable and happy to help you find a wonderful setting you will be proud to enjoy for years to come. 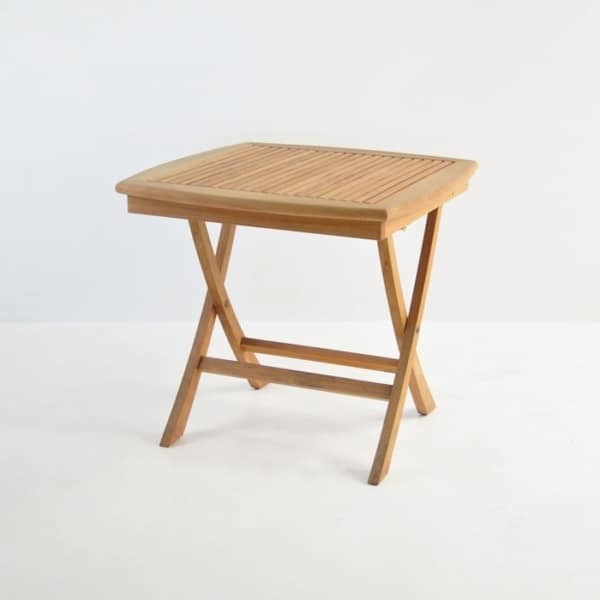 The Toscana Folding Teak Table is masterfully made and ready to make an impact in your home. 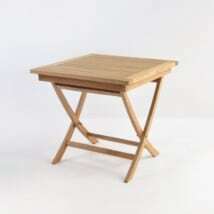 Try this lovely table indoors as an additional side table, or as a serving table for those big soirees! This makes an excellent kids table big dinner parties or a card table when you’re having a serious game with friends over a long weekend. The options really are endless with something this versatile.